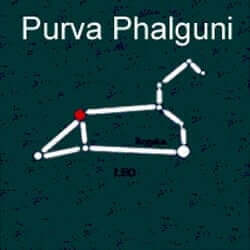 Purva Phalguni is rests fully in Leo. The eleventh Nakshatra’s stellar conterparts are the 2 stars in Leo’s back. They represent arrogance and self-indulgence. Together with Uttara, the 12th Nakshatra, they are known as the “marriage mansions” and are said to hold the spark of attraction and power of love. Ruled by Bhaga, protector of matrimonial relationships, natives of Purva Phalguni often achieve their wealth through inheritance. This birth star may be symbolized by a bed (as viewed from the front – 2 legs only) or fig tree. Like their celestial cousin the lion, natives of this Nakshatra will require adequate time for rest, relaxation and self-care. Generally carefree, they never worry and are known to have very good luck. Their presence is always notable – there is something about them that draws people to them. They use this magnetic quality and their strong communication skills to influence others. These are people who like to be happy, share their blessings and be surrounded by friends and family. Endowed with great valor and stamina, they will work hard to achieve their goals. Natives of this Nakshatra are intended for success and have truly forgiving natures. Poorva Phalguni people can be lazy and self-indulgent when out of balance and they will become increasingly arrogant and narcissistic. They are known to host exceptional parties and must be mindful not to become excessive and overuse drugs and alcohol. Quick to aggression, these natives must be mindful and learn to control their impulses. Known for their striking appearances and luxurious hair, these are attractive people. They tend to have good proportions and be slightly taller and leaner than most. Strongly tied to the group, they love to help others and are known to be kind. Exceptionally lucky, they often receive unexpected wind-falls. Never quick to decide, they will weigh all sides of an argument for they fear they may make the wrong choice. Once they make their decision it will be very difficult to change their stance. A proud group, they do not take criticism well and may not be open to alternative possibilities. They can be very stubborn. Sharp intellect and hard work will bring them to the height of success in their field. Known to excel in many arenas, the natives of Purva Phalguni are perceived to be affluent and successful. They are particularly drawn to work in science, medicine, philosophy and the arts. When operating their own business, they must have strong boundaries with employees, lest they be taken advantage of. Generally overlooked by their parents, they may need to rely on their siblings or a member of the extended family to provide direction in their younger years. Passionate, sensual and playful, they enjoy stable, long-term relationships and tend to marry relatively late in life. They will have a happy harmonious life and a home full of laughter as long as the Purva Phalguni maintains their balance. Generally of robust health, they may face issues including respiratory issues, rheumatic viruses and heart problems. Previous What Is Candle Magic?